We’ve seen how recursion can be implemented efficiently (that is, without stack overflow), and also how the loop special form can be used to simulate a loop in an imperative language. These techniques work well if we’re dealing with simple recursion, in which a single function calls itself. A more complex case is mutual recursion, in which two or more functions call each other recursively. Since recur always directs a function to call itself, it can’t be used in mutual recursion, so we can’t use it to avoid stack overflow. Most simple examples of mutual recursion are somewhat contrived, and the one about to be given is no exception, but it should serve to get the point across. On line 1, we explicitly declare the second function div2-recur since it is referred to in the first function, and the Clojure reader will complain about an undefined symbol unless we declare it. The sqrt-recur function takes a number n as an argument, prints it out, then tests if it is less than 1. If so, n is returned and the function ends. If not, a recursive call is made to div2-recur, passing the square root of n as the argument. The number in the last line is just the final value of n returned from the last call to div2-recur. The first println in sqrt-recur2 prints out its value, and then we get a cryptic line of output which is Clojure’s internal representation of the anonymous function in the last line of sqrt-recur2. The function can take either a single argument, or multiple arguments. Since we invoked it with 3 arguments, we’ll look at that bit (lines 7 and 8) first. trampoline assumes its first argument is a function (sqrt-recur2 in our example above), and it constructs an anonymous function which it then passes back to itself, thus causing the version of trampoline with a single argument to be called. The anonymous function uses apply to apply the function f to the remaining arguments. In our example, the only remaining argument is 5, so sqrt-recur2 is applied to 5. However, look at what trampoline does with the function it is passed. The argument is tested to see if it is a function and, if so, recur gets the function ret to run, and passes whatever it returns as a recursive argument back into trampoline. In our example, calling sqrt-recur2 with an argument of 5 will return an anonymous function calling div2-recur2 with an argument that is the square root of 5. Thus trampoline receives another function as its argument in the recur, so it will call that function and pass its return value back into trampoline. Eventually, one of these function calls will return just a number (when that number is less than 1). At that point, the argument to trampoline will not be a function (rather, it’s just a number), so the recursion in trampoline stops, and the number itself is returned. What has happened is that trampoline handles the mutual recursion by converting it into single recursion within the trampoline function, so that recur can be used to optimize the recursion and prevent a stack overflow. This is yet another example of the power of using first-class functions (functions that can be passed around as arguments to other functions). Now we can run the code by typing just (sqrt-div2 5). Imperative programmers frequently complain that one of the things that makes functional languages hard to learn is their lack of loops. Clojure actually does provide quite a few methods for doing iteration. We’ll have a look at some of them here. Suppose we want to print out a table of squares of certain numbers. In Clojure, we can provide these numbers in a list, as in ‘(1 3 5 8 19) (remember the quote at the start is needed to stop Clojure interpreting the list as a function). To an imperative programmer, the way to do this is to set up a loop over each element in the list, calculating the square of each number. How can we do the equivalent in Clojure? The function squares-table takes a list as an argument. The doseq macro takes two arguments. The first, num here, is undefined before doseq is run. It is assigned each element of numlist in turn, and for each element, the form or forms (you can put any number of forms after the argument list) are executed. In this case, we just print out a string giving the square of num. The ‘nil’ at the end is just the return value of squares-table. This time, squares-times takes a single argument, maxnum, not a list. The dotimes macro takes two arguments. The first, num here, is undefined at the start. It takes on each integer value from 0 up to maxnum – 1. For each value of num, the body of the dotimes is run, so in this case, we’ll get a table of squares from 0 up to maxnum – 1. Incidentally, maxnum can also be a character, in which case it is interpreted as that character’s ASCII code. So if we made the call (square-times \A), we’d get a table of squares from 0 up to 64, since ‘A’ has ASCII code 65. The backslash before the A is needed, since otherwise, Clojure will interpret A as a symbol, not a bare character. Although the doseq and dotimes macros look quite powerful, they have one limitation which results in them not being used as much as you might think. The problem is that they both return only ‘nil’, so they don’t produce any data that can be used in subsequent functions. You might think that this is no big deal, since a ‘for’ loop in an imperative language doesn’t return anything either, but you can, of course define other data structures such as arrays that are constructed within a ‘for’ loop and are then used in subsequent code. Clojure provides several other macros and functions that do return useful data, usually in the form of a list, and these macros are used much more than doseq and dotimes. One powerful function is map. In its simplest form, map takes two arguments. The first is a unary function (that is, a function that takes a single argument), and the second is a list. map iterates through the list and applies the function to each item in the list in turn. The results are returned as a new list. For example, suppose we wanted to create a list of all the squares of numbers within a given range. The following code does this. First, we define a simple unary function square which squares its argument. Then we define squares-map which takes two arguments. Then we call map to create the list of squares. The first argument to map is our square function that we’ve just defined. The second argument must be a list. We’ve used the range function (part of Clojure). When given two integer arguments, range returns a list starting with the first argument and ending with one less than the last argument. Since we want the final value maxnum to be included in our answer, we apply the inc function to add 1 to maxnum before sending it to range. Note, by the way, that this example shows a function square being passed as a parameter to another function map. This shows that functions are just data that can be passed around like any other kind of data; this is something that many imperative languages don’t let you do. map is actually a lot more powerful than this simple example showed. In its more general form, it takes a function that takes any number of arguments, followed by the same number of lists of data. It will then pick off the first element from each list and pass these as arguments to the function, then it will pick out the second element from each list and pass those as arguments, and so on until it comes to the end of the shortest list, at which point it will stop and ignore all remaining data in other lists. For example, suppose we had two lists of numbers and wanted to calculate a number that is the square of an element in the first list added to the square of the corresponding number in the second list. We can do this as follows. We first define a function sum-squares that takes two arguments and returns the sum of their squares (using the square function from earlier). Then we define add-squares that takes two lists, num1 and num2. We call map, giving it the sum-squares function and the two lists. For example, if we called (add-squares ‘(1 3 5 7) ‘(2 4 6)) we get back (5 25 61). This is because 1*1 + 2*2 = 5, 3*3 + 4*4 = 25 and 5*5 + 6*6 = 61. The final 7 in the first list is ignored since there is nothing in the second list to match it with. Finally, we’ll have a look at the filter function. filter iterates through a list and tests each list element against a predicate function (a function that returns true or false). If an element is ‘true’ according to the predicate, it is included in a new list, otherwise it is excluded. The return from filter is a list of all elements from the original list that pass the predicate test. For example, suppose we wanted a list of all the odd squares within a given range. We could do that using filter as follows. Testing this function, we call (odd-squares 3 16) and get back (9 25 49 81 121 169 225). Hopefully these little examples have illustrated the power and brevity of a lot of Clojure code. This post marks the start of my journey into learning Clojure. I should warn the reader that this is very much a journey in progress and I’m not a Clojure expert. However I do have extensive experience in programming in OO languages such as C# and, most importantly, Java. Why is Java important? Because Clojure is a language that is built on, and interacts with, Java. Having said that, this (hopefully) series of posts may prove useful to others in the same situation, since it’s likely that someone with years of OO experience behind him will face many of the same hurdles in learning what is, at first glance, an alien language. I’ve looked through 3 books on Clojure, and all of them suffer to a greater or lesser extent from the same problem: they engage in voluminous waffle at the start about all sorts of technical stuff that may be of interest to a full professional but is of little value (and even less comprehensibility) to someone who just wants to see how Clojure works and start writing a few simple programs. So I’ll keep the introductory waffle to a minimum and try to just dive in and see how things work. First, though, we do need to understand a little about what Clojure is, so that even the simplest program makes some sense. Clojure is a functional language, and is very similar to Lisp (a functional language that’s been around for about 50 years). A functional language is one in which pretty well all code is written as function definitions, and calls to other functions. This contrasts with imperative languages, which include object-oriented languages like Java and C#, and procedural languages like C. Rather than go into waffle mode at this point, I’ll just say that we’ll see how Clojure works by developing a number of programs, rather than by trying to provide abstract explanations that rarely mean anything without some code to anchor it to. Although it’s possible to write Clojure code with a text editor and run it from the command line, I have grown so used to having an IDE for software development that the first thing I did when I thought of learning it is to find a decent environment in which Clojure can be written. My Java IDE of choice has always been Netbeans, and there is a Clojure plugin for Netbeans that is relatively painless to install. It is called Enclojure, and is available by following the instructions at http://www.enclojure.org/ on the Getting Started page. One word of warning however: do NOT, repeat NOT, visit the Download link from Enclojure’s page; there is nothing there that you need, and in fact if you try to install one of the plugin files from that page, it won’t work. Just follow the instructions on the Getting Started page. After you install Netbeans and Maven, the bit about the “one time setup for Enclojure plugin” works all on its own, without the need for you to manually download anything. Finally, in the section on “getting started with the enclojure plugin in Netbeans”, it is very important that you do a ‘clean and build’ on the project before trying to open the REPL (I’ll say what a REPL is in a moment). The first time you build a project, a pile of files will be downloaded that are needed to run Clojure, but again, this is all handled for you so don’t worry. If you’re an Eclipse fan, there is a plugin called Counterclockwise that allows you to write Clojure code. I’ve installed it and run a simple project with it so I know it works, but I haven’t used it beyond that. The ‘ns’ refers to a namespace, but don’t worry about that now; we’ll get to those later. Just notice that it’s the same namespace you entered when you created the project. Lines beginning with a semi-colon are comments. The ‘import’ and ‘require’ bits are optional things you can do with a namespace; again, don’t worry about this for now. 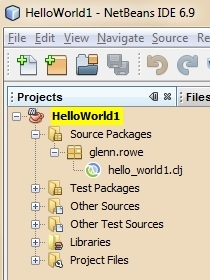 If you look at the folders into which Netbeans put your hello_world1.clj file, you’ll see that they follow the structure HelloWorld1\src\main\clojure\glenn\rowe. The last two folders are the first two elements of the namespace, while the last element of the namespace is used for the Clojure file name. If you’re familiar with packages in Java, you’ll see that similar strategy is being used here. Although they aren’t quite the same thing, for now you can think of a Clojure namespace as similar to a Java package, in that it provides a wrapper in which code can be written. As you might guess, println prints something to the output, and “Hello world!” is what it prints. But how do we get it to do this? This is where the REPL comes in. REPL stands for “read, evaluate and print loop”. It acts like a console window in which you can interact with your Clojure program. You can start a REPL in an ordinary command console window in Windows if you like, but since we’re using Netbeans, we’ll use Enclojure to bring up a REPL. You can actually type raw Clojure code directly into the REPL, but we want to get the code in the hello_world1.clj file to run. To do this, we need to load this file into the REPL. Make sure you save the file first, since unlike many builds in Netbeans, this doesn’t happen automatically. Right click on the HelloWorld1 project again and select “REPL->Load all Clojure files in Source Packages”. You see that the println has printed its output. So what exactly just happened? First, we remind you that Clojure is a functional language, so println is a function (a built-in function provided as part of the language). The string “Hello world!” is an argument to the function (that is, it’s what println will print). A function call in Clojure is always written as a list of what are called forms enclosed within parentheses. A form can be a literal (a fundamental element that evaluates to itself), such as a number or, as here, a string. It can also be a symbol, which evaluates to something defined elsewhere in the program. println is a symbol, since it refers to code that implements the printing capability. In this case, the println function has been written for you, but it is of course possible to define your own functions, which we’ll get to later. is an example of a compound form. A function call can return a value, or it can return ‘nil’ (roughly equivalent to Java’s ‘null’). The println function returns nil, since all it does is print something to the screen and has nothing to do or say beyond that. This is where the ‘nil’ that is printed to the screen after ‘Hello world!’ comes from: the REPL will print the return value of a function call. Although most statements in Clojure consist of lists enclosed in parentheses, a literal is also a valid statement on its own. Try typing some numbers directly into the REPL. You’ll see that they evaluate to themselves and the REPL just prints the same values back to the screen. That will do for an introduction, but if you want to try a bit of arithmetic, you can try entering, directly into the REPL, statements like (* 34 56) to do multiplication or (+ 9.3 –783.2) to do addition and so on. Again, these are predefined functions, but this time the function name is the arithmetic operator, and the arguments are the two numbers you enter afterwards. You can also try nesting function calls by saying something like (+ (* 2 5) 3) (see if you can figure out what it will say before you type it in).